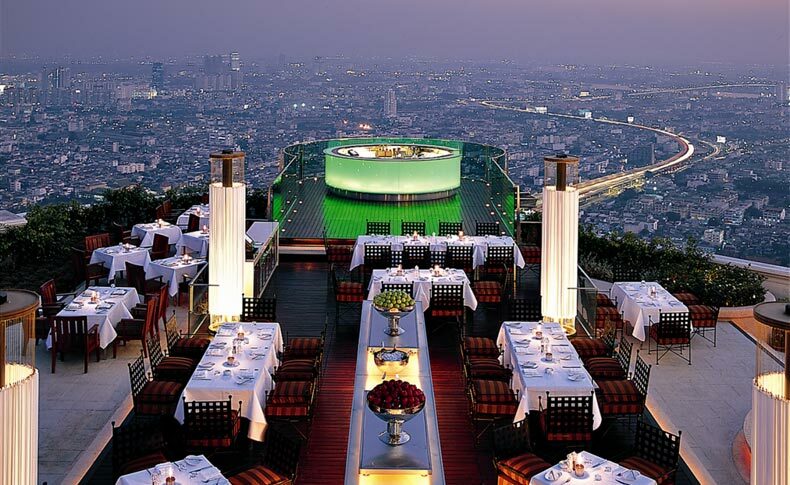 At 230 meters, is the Sirocco Sky Bar located on the roof of Lebua Hotel in Bangkok and is also known as the Hangover Bar. This bar is located just 230 meters above the ground and is thus one of the highest bars in the world. Panorama, dresscode and drinks are especially exquisite and so it is not unusual that celebrities like to celebrate here. With the film, Hangover Bar launched at the best rooftop bars all over the world and enjoys a reputation that is hard to beat. The rush for the film was remarkable and now special Hangover packets are offered at the Sirocco Sky Bar which includes authentic drinks from the blockbuster strip. The Sky Bar pays particular attention to style and etiquette; making for a very selected crowd. The cocktail menu is inspired by the most diverse creations. The Hangovertini is a classic you should seek out. It consists of Martini Rosso, apple juice, green tea liqueur and rosemary honey. This drink is reminiscent of the movie, but in no way represents the many specialty drinks that are usually served at the bar. In the early evening, it is primarily the light white wines that resonate. The darker and later the evening, the more likely you will be enjoying a gin and tonic or the Dark’n’Stormy, as they call it. The mood in the Sirocco Sky Bar is always lifted and pleasant. In order to spend a wonderful evening here, you should have the right company. Come with an exclusive lady from our companion agency fly out to you to enjoy the city and the views of Sirocco Sky Bar.